The Cellar Garden Experiment is described in the first post in that category. It is an attempt to determine how much artificial light is needed to grow food if little or no natural light is available. I have built an artificial greenhouse in my cellar. Pots are numbered 1 through 8 starting on the left end of the row. The lights are at the ends of the row near pots 1 and 8. Pots 1 through 4 each have one tomato plant and one pea plant. Pots 5 through 8 each have two tomato plants and four pea plants. By using the vertical lights at either end of a line of plants I’m hoping to discover how far from the lights the plants will grow and produce food. By having half the pots densely planted I hope to find out how dense planting affects the health and yield of the plants. According to my Kill A Watt electricity monitor, this setup used an even 100 kilowatt-hours of electricity in 61 days for an average of 1.64 kilowatt hours per day. My electric bill works out to about $0.145 per kilowatt-hour once you count all the fees and taxes, so this experiment is costing me a little less than a quarter per day in electricity. 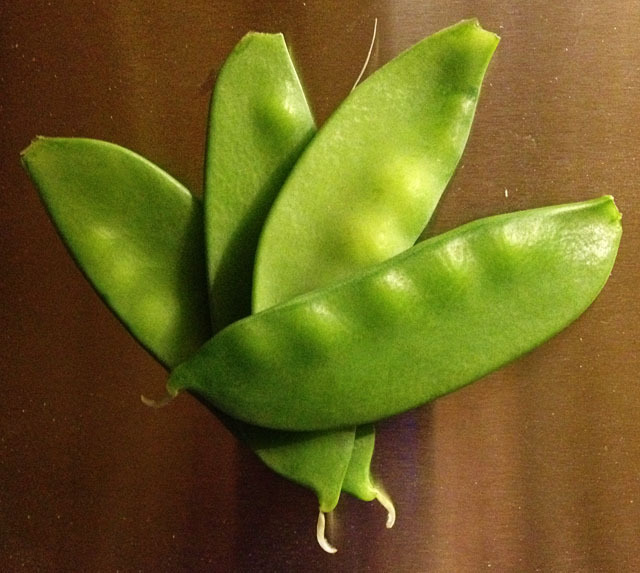 I harvest the peas while they are still small since I like eating pea pods more than peas. The values in this table are in ounces. I measure in grams since my scale can measure down to one tenth of a gram and then I convert to ounces since I’m in the US. Four peas is about one-third of an ounce. It probably takes around 45 – 50 peas to make a pound. The peas died when we went to Florida for a week near the end of April. Once I pulled out the pea vines, the tomato vines started growing better. That was 190 days into the experiment so they were at a significant disadvantage. In the end only the vines closest to the lights produced anything and all the fruit produced was very small. The plants were root bound, cold, never exposed to pollinating insects, and light starved. I was surprised they produced anything at all. I’m going to call the experiment over and done today, Oct 17th (Day 348), even though the vines are still growing just fine. 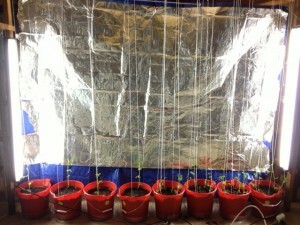 Day 16 (Nov 18) – Transplanted all plants. Probably too early for the tomatoes, but the peas were getting much too big. Day 54 (Dec 27) – Measured pea plant in pot 2 has reached the top of the enclosure (5 1/2 feet tall). The yard stick has been moved to the tomato plant in pot 1. That tomato is about 10 inches tall. Day 63 (Jan 5) – There is a bud visible on one of the pea plants (pot 3). 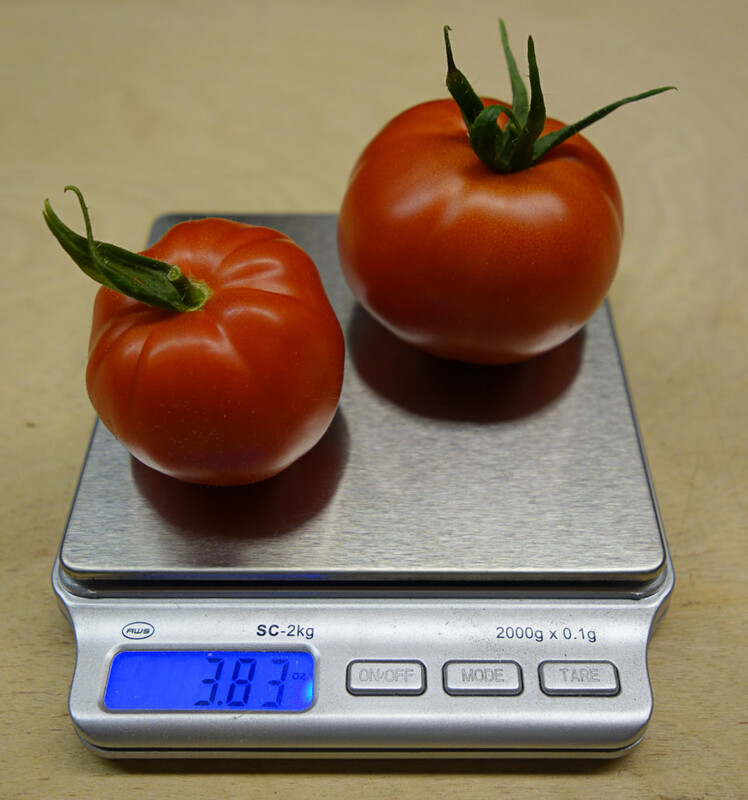 The measured tomato in pot 1 is about 12 inches tall. Day 66 (Jan 8) – There is a flower visible on one of the pea plants (pot 8). Day 73 (Jan 15) – There is a pea visible on one of the pea plants (pot 8). The measured tomato in pot 1 is about 14 inches tall in the middle (not counting the side branch that is sticking up due to the support string). Day 105 (Feb 16) – First harvest: one pea (0.03oz) from pot 7 and four peas (0.44oz) from pot 8. Day 112 (Feb 23) – First tomato buds are visible. Day 140 (Mar 23) – First tomato flower open. Day 190 (May 12) – Pulled out all the pea vines. They had passed away during our trip to Florida in late April. Day 253 (July 14) – First green tomato appears. Day 303 (Sep 2) – First ripe tomato. Day 348 (Oct 17) – End of experiment.